« Illegal Immigration: The New African Slave Trade. Luxembourg Thieving Plutocracy Kills Italy! This entry was posted on September 19, 2018 at 6:25 pm and is filed under Plutocratic Conspiracy, Systems Of Mind, Systems Of Moods, Systems Of Thought. You can follow any responses to this entry through the RSS 2.0 feed. You can skip to the end and leave a response. Pinging is currently not allowed. Oui oui oui! If only republics would enact laws to prevent the cooptation of elected officials by Plutos! J’aime la France, plus que l’Allemagne. Germans were plenty crazy, and for a long time. Full of madness in German philosophy. You also explained that USA supported the Kaiser in WW1, until 1917. Funny you didn’t mention it this time. It was bait and switch! Vive la France, like Benign says! Can you give me a source for this attitude that the British wanted France to lose in 1940? This is the second answer I’ve seen suggested, and I find the idea somewhat troublesome since I thought France and Britain were pretty strong allies since WWI, where hundreds of thousands of British soldiers were killed and maimed to help their French brothers in arms defeat the Germans. I never said the British wanted France to lose in 1940. As the UK and France had sent a joint ultimatum to Hitler and had jointly declared war to Nazi Germany, and jointly made several landings in Norway, with the aim of cutting in half Hitler ally Sweden… That would have been rather self-defeating. Churchill, a self-contradicting francophile, and fluent French speaker, ordered to keep crucial air squadrons in reserve. That was a mistake: it probably made the difference on May 13, 1940, as the French and British air forces were unable to disrupt the heavy concentration of the entire Luftwaffe where it succeeded to break through, crossing the Meuse. 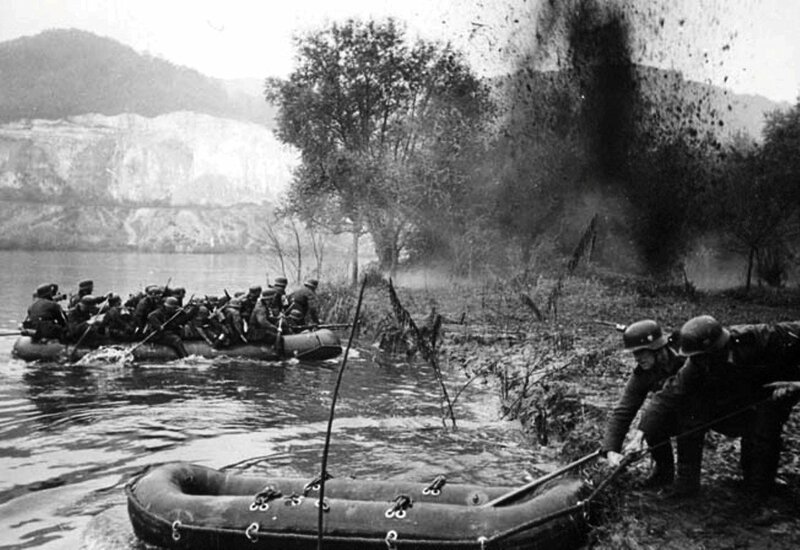 In particular, the French B division got pummeled, and the Nazi pontoon bridges were not destroyed. The cowardly French trope is almost entirely a figment of Fox News imagination. Napoleons troops. Verdun. Your foriegn Legion and even Eric Cantona prove the lie in their words. The Duke Of Normandy had a claim to the English throne, he only came over when Edward died as was related. He also had Breton blood ( British blood) in him too. Godwinson had zero claim. The way you talk is like it was the Kingdom Of France that came over, it didnt ! Chris: Sorry if I gave the wrong impression. You are indeed right that William, in several ways, had a righteous claim to the throne of England. It had been the plan, indeed, from the preceding king. The real problem of England was that all of it had fallen under brutal Danish control, a generation earlier, in a spectacular war. The comment on Blum is anti-Semitic. I didn’t see an “antisemitic” “comment on Blum”. That Blum got intimidated is a fact: first the French government of Blum said, per the request of the Spanish Republic, France would intervene. Loud and clear. Then the USA screamed against France, and Blum backed off. It’s easy to check that chronology. Meanwhile Texaco gave Hitler enough fuel to fly the rebellious Spanish armies from Africa to Spain (they were blocked by the Spanish Navy).